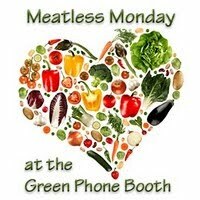 Here at the Green Phone Booth, we've been encouraging you to make your Mondays meatless. Ready to take it one step further? This past week I came across a video from the TED conference by Graham Hill, who ponders: If we know that eating too much meat is unhealthy, both for us and the planet, then why are more of us not vegetarians? He says, "What I was being pitched was a binary solution. It was either, you're a meat-eater or you're a vegetarian. And I guess I wasn't quite ready." But maybe it doesn't have to be an all or nothing proposition. Hill proposes a third solution: weekday vegetarianism (vegetarian Monday through Friday, meat-eater on the weekends). Afterall, as he points out, "If all of us ate half as much meat, it would be like half of us were vegetarians." What do you think? Are you ready for weekday veg? I've been pretty light on the meat for a number of years, always thinking "I could easily be a vegetarian" but oh how I like salmon and seafood! Well, and the once a year beef at the holidays. (and I hadn't seen this post yet! I lived the vegetarian life for a number of years, but, frankly, just don't think I could do it again. I don't mind and honestly don't notice a few meat free meals. Like Nana Sadie I just enjoy a number of meats! Same here! I've cut down on meat, especially red meat. Even if I do eat meat, it is more like an accompaniment instead of being the main dish. I've been veg for years - I think I originally went partially veg back in 1995, cutting out red meat, and gradually became totally veg over the couple of years following that. Saying that, I LOATHE the "vegetarian" label. I think its divisive, and confrontational, and it causes more problems than it solves. As communities around the world, it is very clear to me that we need to reduce our meat intake overall, but I think that the "all or nothing, us versus them" fight stance is wrong. We need to work together - people who don't want to consume meat at all, together with those who have decided a little is okay for them, right through to those who think that there is no way they're cutting down at all (although I don't necessarily agree with their decision, they have the right to choose it). So I see this "weekday veg" thing as a good step forward. We're all on this world together, we need to work together, we need to accept decisions that may not necessarily be our own, and maybe "one size fits all" is NOT the way forward. That said, I still think being veg rocks :-) And it's really worth giving a go!